'Dirty Harriet' author Miriam Auerbach reads one of her novels to Elvira, her corgi. That’s what Miriam Auerbach was thinking about 10 years ago while watching a television marathon of the iconic detective films starring Clint Eastwood. “Suddenly I had a vision of Dirty Harry as a woman. So she was born,” says Auerbach. Three years later, Auerbach published “Dirty Harriet,” the first in a series of satirical mystery novels. The protagonist is Harriet Horowitz, a gun-toting, Harley-riding former Boca Raton socialite who becomes a crime-fighter. Auerbach (whose real name is Potocky; Auerbach is her nom de plume) says she has more in common with Harriet than most people realize. “Definitely, she’s a crusader for social justice,” says Auerbach, a professor of social work at Florida International University. Another parallel: Auerbach spent much of her youth traversing the United States on a Harley with her first husband, a wild child who doubled as an evangelical preacher. Are her students surprised to discover that the shy, quiet woman leading their class has a literary alter-ego who rides a hog and packs a 44-caliber Magnum? “They tend to be a little shocked,” says Auerbach with a laugh. 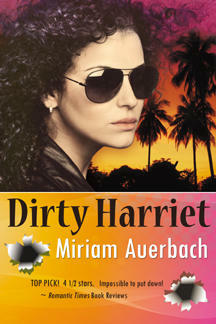 Reporter Christine DiMattei interviews South Florida author Miriam Auerbach, who's now writing her fourth book in the "Dirty Harriet" series of satirical mysteries. But parts of Auerbach’s own history are more harrowing than any fictional work. Before the start of World War II, just as Adolf Hitler was gaining power, her Jewish paternal grandparents smuggled their two sons out of Czechoslovakia to a foster family in London before perishing in Auschwitz during the Holocaust. Auerbach was born in Prague and lived there happily with her family until 1968, when the Soviet Union sent Warsaw Pact troops into Czechoslovakia to crack down on reformist trends. Auerbach’s family spent several months traveling throughout Europe, before arriving in the United States and settling in Denver, Colorado. She threw herself wholeheartedly into her studies and as a teenager, was fascinated by science and decided to become a particle physicist. A brief internship at Los Alamos National Laboratory in New Mexico, the birthplace of the atomic bomb, led to some heavy soul-searching. “I did not want to work on armaments,” says Auerbach. Auerbach pursued a degree in social work while living on the fringes of the biker world with her first husband, an Elmer Gantry-ish preacher. When he became abusive, she fled the marriage (unlike Dirty Harriet, who merely blows her bullying spouse away with the Magnum). “I think I've always sort of lived in two worlds. I’ve always sort of led a bifurcated life,” she says. She moved to South Florida after FIU offered her the teaching position. She remarried and now lives in West Palm Beach with her husband David and their two dogs. Auerbach followed up “Dirty Harriet” with two sequels and is now working on a third. “My husband thinks she should play ‘Dirty Harriet’ in the movie,” says Auerbach, with a twinkle in her eye.